Since the late 1970s the craft beer movement has been growing among both brewers and consumers based on the desire to drink something besides mass-market macro-brewed lagers. These light, flavorless beers often are brewed using substantial percentages of adjuncts such as corn (maize) or rice in order to achieve an extreme degree of lightness in color, clarity, calories, and flavor. However, in our zeal to make different styles of flavorful beer at home we should not throw the baby out with the bath water. While a lot of macro-lagers are brewed using corn, if that style of beer is not for you, you still should not point to corn as a villain. On the other hand the judicious use of corn can help us brew some very flavorful styles of beer, many that have been around for a long time. In colonial America, brewers used what was available as sources of fermentables. These options may have included corn, pumpkins, fruit, and other grains that could be had in excess at certain times of the year. When German brewers came in droves to the United States in the 1800s they had to learn how to brew with American 6-row barley malt instead of the two-row malts of their homeland. Six-row malt was a bit huskier in flavor than 2-row malt and they discovered that corn could be used to lighten up lager beers to emulate those brewed solely from 2-row malt in Germany. Six-row barley is also higher in protein and enzymes than 2-row (especially back in the 1800s), and corn and rice can dilute that protein to create more stable beers with less haze issues. Corn can also play a role in a variety of Belgian, British, and American ales, as well as many varieties of lager beer. I have used flaked maize to adjust the flavor and body of English bitters, German lagers, classic American Pilsner, and cream ale, to name a few. There are many approaches to using corn in a beer recipe, and different forms of corn you can add, including malted corn, cornmeal, corn grits, flaked maize (as shown in the photo on this page), popped corn, corn sugar (dextrose), and even corn that has been chewed and spit into a pot (chicha). Some of these forms of corn are readily available or easily handled and others are not. Malted corn is not readily available commercially, but can be made in the same way wheat or barley malt is made by sprouting and drying the grain under controlled conditions. Making corn malt is certainly doable at home, but is a time and space consuming process and not practical for most homebrewers to do for themselves. Popped popcorn is not easily incorporated into a mash due to its fluffy, floating nature. If you are considering popped popcorn in a mash, it is best to use an air popper rather than a kettle and oil as the oil can cause problems with beer foam later on. Popped popcorn is also easier to handle if it is crushed into smaller pieces before mixing into the mash. Producing chicha by using one’s own saliva as a source of amylase enzymes to convert the starches into fermentable sugars by chewing and then expectorating corn into a “mash” is also both time consuming and may not be a very acceptable approach of including corn in your beer unless you are going to be the only one drinking it (although Dogfish Head Craft Brewery makes a chicha beer!). Of the various forms of corn that are the most practical for you to use in a brew, cornmeal/grits, flaked maize, and corn sugar (powder or syrup) are the most practical forms for homebrewers to use. Each of these three forms of corn require different treatment and each will result in a somewhat different flavor, body and clarity in the finished beer. In order for yeast to be able to ferment what ends up in wort, those ingredients must be in the form of sugars. To make corn fermentable, the starch it contains must first be gelatinized by being cooked in water between 158–167 °F (62–75 °C) or higher for about 30 minutes. Since we want to be certain that gelatinization is complete, the simplest way to do this is to cook the corn addition in boiling water. After gelatinization is complete, the starch can then be converted to sugar by amylase enzymes in the mash. As you can see, some forms of corn require extra preparation for brewing and some can go right into the kettle as is. In the case of corn sugar, starch gelatinization and conversion of starch to sugar has already been taken care of and the sugar can simply be added as corn sugar in powdered form or as syrup directly into the wort. Flaked maize is made by steaming and pressing (thus gelatinizing and drying) corn through hot rollers, and thus can be added to the barley malt mash where the enzymes that convert the starch in the barley malt will also convert the starch in the flaked maize. Corn grits or cornmeal must first be cooked in water until the starch is gelatinized before they can be added to the barley malt mash for conversion to sugar. Your brewing setup, the time and effort you wish to invest in the process, and the flavor profile desired in your beer will determine which form of corn you may wish to use in your recipe. For most beer recipes you will typically want to limit the amount of corn to 30% of the total fermentables. Too much corn can result in some cider or solvent-like flavors in the finished beer, risk incomplete conversion in the mash, and dilute FAN (free amino nitrogen) too low for adequate yeast nutrition. Using more than a pound (0.45 kg) of powdered corn sugar or more than 1.25 cups (296 mL) of corn syrup in a 5-gallon (19-L) batch of beer can lend cidery or solvent-like flavors to the finished beer. More than 3 pounds (1.4 kg) of flaked maize or cornmeal in the mash of a typical 5-gallon (19-L) batch of beer may stretch the enzymatic capacity of the barley malt and result in incomplete conversion of starch to sugar. This may leave the beer a bit hazy rather than clear if you are brewing a style where a clear beer is desired. With those corn caveats in mind, let’s look at the specifics of using various forms of corn in beer. Corn sugar, often used in a powdered form as priming sugar when bottle conditioning beer, is the easiest form of corn to add to a beer recipe. Whether using powdered corn sugar or corn syrup, you can add it anytime, but most often near the start of the boil. Simply turn off the heat to add it to your boiling wort; add the corn sugar and stir until it is completely dissolved to avoid any of it sticking and scorching on the bottom of the kettle. You can then resume heating the wort back to a boil and proceed as normal for the rest of your recipe. Corn syrup sold in the supermarket may contain vanilla, molasses, salt, or other flavorings, so check the label for any of those additives. Flaked maize is the next easiest form of corn you can include in your beer. If you are an all-grain brewer, simply include the flaked maize in with the rest of your mash ingredients and proceed as usual. If you are using 6-row barley malt as base malt, the flaked maize and any other adjuncts that depend on the barley malt enzymes for conversion should be limited to no more than 50% of the dry weight of mash ingredients. If you are using 2-row barley malt, the flaked maize and any other adjuncts that depend on the barley malt enzymes for conversion should be limited to no more than 30% of the dry weight of mash ingredients. If you are capable of doing a partial-mash, you can make a mixture of one part crushed barley malt to one part flaked maize, place it in a muslin bag, steep it in 148–158 °F (64–70 °C) brewing water for 30 minutes, remove the bag of grains, and let the liquid drain into the brew kettle before proceeding on with the rest of your malt extract brewing process. 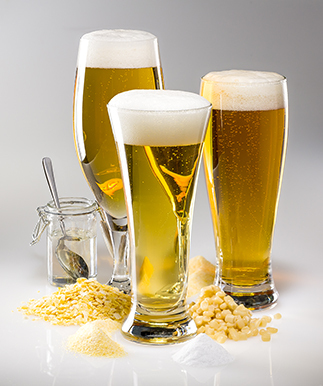 Most large commercial breweries use milled corn grits when including corn in their beer. Milled corn grits are corn that has had the germ and bran removed, then the starchy part ground into a coarse meal, typically available to consumers as “cornmeal” or “polenta” used in cooking and baking. Hominy grits are corn that has been treated with alkali and then ground into coarse meal and is a staple in American Southern cooking. To perform a cereal mash using cornmeal or grits, combine 10% 6-row barley malt or 15% 2-row barley malt by dry weight with the corn. Place the cornmeal or grits in a heavy saucepan and add water until the mixture is like a soupy batter and begin heating it. Carefully heat this cereal mash to 158 °F (70 °C) and hold it at that temperature for at least five minutes. This will allow the amylase enzymes supplied by the malt to convert stray starch molecules and begin to loosen the remaining starch “granules” in the corn. The heavy lifting of starch conversion will take place in the main mash. After the short conversion rest at 158 °F (70 °C), add heat to bring the cereal mash to a boil and boil it gently for 30 minutes. You will need to stir the mash constantly and may need to add water to keep the mixture fluid and moving to prevent it from scorching on the bottom of the pan. At the end of the cereal mash cooking process, the starch will have gelatinized and be in a form that the amylase in the main mash will be able to convert to sugar. Be aware that the addition of the cereal mash can significantly alter the temperature of your main mash, especially if the cereal mash is just off of a boil. If you cook the cereal mash early in your brewing process, you can add cold water or ice cubes, or simply allow it to cool on its own to the desired temperature of your main mash. In this way, when the cereal mash is added to your main mash the effect on main mash temperature should be negligible. Otherwise, you can mash in at a temperature slightly below starch conversion temperature (149 °F/ 65 °C) and allow the cereal mash to bring the entire mash to the desired conversion temperature. Again, have some cold water or ice cubes on hand to add to the mash to cool it down if your initial mash-in temperature is higher than desired. Keep good notes on quantities and temperatures during the process and you should be able to zero-in on hitting the desired temperature when adding a cereal mash to the main mash in the future. If you use one of the brewing software programs, they often have cereal mash or decoction calculators to help determine how a certain quantity of recently boiled cereal mash will change the temperature of the main mash. At prior times in brewing history corn was used out of necessity because it was one of a few sources of starch available to brewers, and it also helped to lighten the flavor of husky American 6-row barley in lager production. Corn has also been used to reduce brewing costs. But corn is more than a one-note ingredient, and today’s homebrewers can use corn as a unique ingredient to help make better beer just as you would use any other specialty malt or adjunct. Regardless of your brewing process, corn can be included in a variety of forms to work its magic in many different styles of beer. Classic American Pilsner was historically brewed with six-row malt with corn to emulate two-row Pilsner malt used in Germany. Classic American Pilsner is a bigger beer than modern light lagers and should be of medium body with medium to high carbonation. The grainy, bready character of Pilsner malt should provide a good base for European or American noble-type hops. This is a single infusion mash. Mix the crushed malt and flaked maize with 3.6 gallons (13.6 L) of water to stabilize the mash at 151 °F (66 °C) and hold for at least 60 minutes. Sparge with 3.6 gallons (13.6 L) of 170 °F (77 °C) water adjusted to pH 5.7–6.5. Collect 5.4 gallons (20.4 L) of wort, top up with water to 6 gallons (23 L) and conduct a 60-minute boil. Add hops per the schedule on the ingredients list. At the end of the boil, you should have 5 gallons (19 L) in your kettle. After the boil, give your wort a stir to create a whirlpool, then let the wort settle for 30 minutes prior to chilling. Cool the wort to 50–55 °F (10–13 °C) for fermenting, aerate well and pitch your yeast. Maintain fermentation temperature between 50–55 °F (10–13 °C). After seven days, rack to secondary fermenter. When fermentation is complete and beer has cleared, bottle or keg as usual. Mix the crushed malt and flaked maize in a large muslin bag and submerge in 1 gallon (4 L) of water to stabilize the mash at 151 °F (66 °C) and hold 60 minutes. Remove the grain bag from your brewpot and place in a colander. Wash the grains with 1 gallon (4 L) of hot water, collecting the grain wash back in your brewpot. Remove wort from heat and stir in the dried malt extract until all the extract is fully dissolved. Top up with water to 6 gallons (23 L) and bring to a boil. Conduct a 60-minute boil, adding hops per the schedule on the ingredients list. At the end of the boil, you should have 5 gallons (19 L) in your kettle. This is a classic, refreshing lager that‘s great for a hot day at the beach —or any other occasion that calls for an easy-drinking, crisp beer. This is a single infusion mash. Mix the crushed grains and flaked maize with 3.7 gallons (14 L) of water to stabilize the mash at 150 °F (66 °C) and hold for at least 60 minutes. Sparge with 3.7 gallons (14 L) of 170 °F (77°C) water adjusted to pH 5.7–6.5. Collect 5.5 gallons (20.8 L) of wort, top up with water to 6 gallons (22.7 L) and conduct a 60 minute boil. Add hops per the schedule on the ingredients list. At the end of the boil, you should have 5 gallons (19 L) in your kettle. After the boil, give your wort a stir to create a whirlpool, then let the wort settle for 30 minutes prior to chilling. Cool the wort to 55 °F (13 °C) for fermenting, aerate well and pitch your yeast starter. Ferment at 55°F (13 °C) for 10-14 days, rack to secondary fermenter while some yeast activity is still evident and allow to warm to 68°F (20 °C) to finish fermenting for a diacetyl rest. When fermentation is complete and beer has cleared, bottle or keg as usual then cold condition between 32 °F (0°C) and 40 °F (4°C) for at least one month. Mix the crushed malt and flaked maize in a large muslin bag and submerge in 1.5 gallons (6 L) of water to stabilize the mash at 150 °F (66 °C) and hold 60 minutes. Remove the grain bag from your brewpot and place in a colander. Wash the grains with 1.5 gallon (6 L) of hot water, collecting the grain wash back in your brewpot. Remove wort from heat and stir in the dried malt extract until all the extract is fully dissolved. Top up with water to 6 gallons (23 L) and bring to a boil. Conduct a 60-minute boil, adding hops per the schedule on the ingredients list. At the end of the boil, you should have 5 gallons (19 L) in your kettle. Brewers often add adjuncts right into the main batch of beer before or during fermentation with the hopes that the characteristics of the beer will play nicely with the additive. But Michael Tonsmeire explains that fermenting the two separately may sometimes be your best approach.